ROME (UrduPoint News / Sputnik - 16th April, 2019) The troops of the Libyan Government of National Accord (GNA) are able to protect Tripoli and drive advancing forces of the Libyan National Army (LNA) led by Field Marshal Khalifa Haftar out from the capital, Ahmed Maiteeq, the deputy prime minister of the GNA, said on Tuesday. 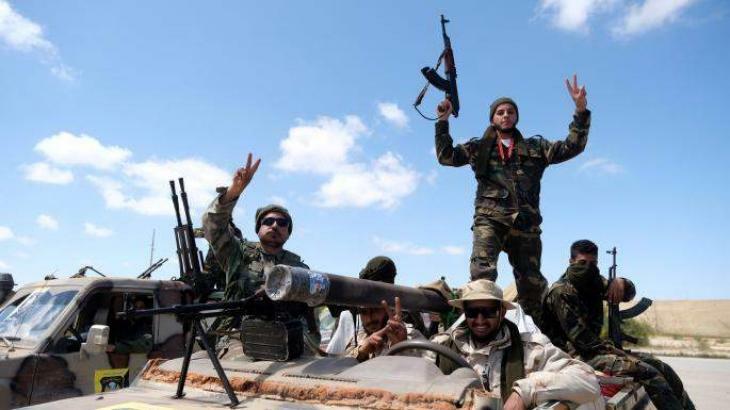 On April 4, Haftar, backed by the parliament based in Tobruk, announced an offensive against Tripoli in a bid to drive what he called terrorist forces out of the city. In response, armed forces loyal to GNA started a military operation against the LNA. "We are able to protect Tripoli, and we are ready for this, we will drive Haftar's militia back to where they came from," Maiteeq said at a press conference in Rome. According to Maiteeq, the situation on the ground in Libya has improved significantly two weeks after the beginning of Haftar's offensive. "The position of the GNA is clear. We are talking about a coup, Haftar must go," he said, calling the LNA's offensive "an invasion" and an "attack on the legitimate government." Maiteeq also announced GNA's readiness to discuss the introduction of a no-fly zone in Libya. "We want Haftar's retreat: this is our main priority in order to stop people's deaths ... If the international community wants to discuss this [no-fly zone], there are no problems for us," he said.